Are you among the millions of people who are missing one or more teeth? This problem can diminish your self-esteem and cause discomfort; it can even contribute to a range of oral health problems beyond appearance issues. Replacing your missing teeth is of great importance! While there are several tooth replacement methods available, we often recommend dental implants in Kaukauna as the best way to fill in the gaps in a smile. Strength. Dental implants form a sturdy bond with the jawbone, making them the strongest tooth replacement option available. Stability. Some types of tooth replacement, such as traditional dentures, may slip out of place during eating and speaking. That is never a problem with dental implants. Durability. If you care well for your dental implants, you can expect them to last for decades — they could even last for the rest of your life! Facial support. When you lose a tooth, the bone that used to support it begins to deteriorate, which can lead to changes in the shape of your face. Dental implants stimulate the jawbone and help it to stay strong and complete. Also, because implants support your cheeks from the inside, you may be able to avoid the “sunken” look that often afflicts people who have suffered significant tooth loss. Predictable results. Dental implants are successful in over 95 percent of cases. With dental implants, your smile will once again look complete, and there’s no reason anyone would ever know you’ve ever lost a tooth. Drs. Robert and Heather Heil of Dental Expressions near Kaukauna, WI can provide dental implant restorations once the dental implants have been surgically placed. The type of restoration they provide will depend on the extent of your tooth loss. If you need to have just one tooth replaced, you’ll likely receive a single dental implant accompanied by a single crown. If you are missing several teeth in a row, an implant-supported bridge may be an appropriate solution for you. This type of restoration has two crowns on top of dental implants. One or two pontics (artificial teeth) are suspended between the crowns. An implant-supported denture, which can replace all of the upper or lower teeth, is a fitting solution for many patients who have suffered extensive tooth loss. The denture may be either a fixed or removable prosthesis. Essentially, the dental implant process has two stages: placement and restoration. The surgery when you receive your implants, and the new teeth that will go on top of them, each come with their own cost. Logically, the more extensive your tooth loss, the more the total price of your restored smile will be because you will require more implants and a larger restoration. When you attend your implant consultation, you’ll gain a clearer picture of how much your procedure will cost. Although this treatment tends to cost more than alternative tooth replacement methods, it is a worthwhile investment! The long-term benefits that implants provide for your oral health, confidence, and appearance make them a truly life-changing treatment. 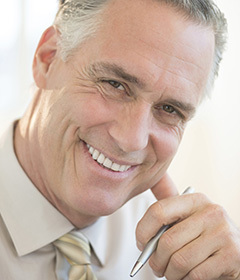 Would you like to discuss the possibility of dental implants with one of our Kaukauna dentists? Contact Dental Expressions to make an appointment. We serve patients from all of the Fox Cities, including Appleton, as well as Green Bay. We want to make sure that you have a smile you can be proud of, and we help make this happen with dental implants.